If you plan to have a few friends over for a Superbowl Party, food is certain to be a major part of the evening's entertainment. In fact, food is the most essential part of any game day party that you may decide to have this winter. This is always true whether you decide to invite friends over to watch a fun sports competition between your favorite college teams, a boxing match, or any other televised event. On one hand, you want everyone to have a good time, with plenty of festive, hearty food to enjoy. On the other hand, you probably do not want to be distracted from watching the game yourself while you put together an elaborate meal, or stand outside alone in freezing weather barbecuing on the back patio. Instead, you want ideas for easy, appetizing meals that are quick, affordable and satisfying. Shown below are some simple Super Bowl menu tips, as well as fun ways to liven up the party with decorations and other creative party ideas. Pick up a selection of Subway sandwiches. Serve along with mustard, mayonnaise, ketchup and similar accompaniments. Add chips, dips, bowls of nuts, pretzels, chocolate chip cookies, and beverages, and you're all set. Buy a couple of buckets of chicken along with the mashed potatoes, biscuits and coleslaw that often come with it. Add a bag of green salad from the grocery store, and see if you can pick up a football shaped cake or cookies to go with it. Use this Amazon link to find a wide selection of cheap Super Bowl Party Supplies. Buy a Honey Baked ham or turkey, provide large rolls, and let everyone make their own sandwiches. Although the ones from the Honey Baked Ham Store are delicious, similar products are also available at Costco and some grocery stores. Provide mustard, mayonnaise, ketchup, coleslaw, and a selection of salads, and your meal is complete. Finish off with a variety of cup cakes, perhaps iced in the colors of the home team. Invite your friends over for a potluck. Ask them to bring a dessert or side dish, while you provide the main course. You can do something as simple as make a big pot of chili and serve it with hot dogs. Another possibility is to bake frozen lasagna from the grocery store and serve it with a bag of green salad. Set out a plate of cookies. You have now put together the basics. Anything else your friends bring will simply broaden the selection of available foods. At the same time, you have all the essentials covered, in case some of your friends show up empty handed! If you don't want to stay up late after the game doing dishes, make sure you have plenty of paper plates or other disposable dishes available. Set out a large trash can, lined with a plastic bag, so that everyone can dispose of their plates and plastic cutlery when they are finished eating. Let everyone serve themselves. Place a few bowls of candy around for anyone with a sweet tooth. If the beverages are in the refrigerator, instead of out on the buffet table, show everyone where they are located and let them help themselves. A Superbowl Party is the kind of event that should be relaxed and homey. If you and your friends have gotten together to cheer on a favorite local team, you'll want to spruce up your home décor with some fun sports memorabilia. Start with your buffet table. As mentioned, you could serve cookies or cup cakes that have been iced in the colors of the home team. If you are lucky, your local grocery store may even have some cute football themed cookies available in their bakery department, such as the ones pictured with this article. If those aren't available, ask the bakery to bake you a cake in the shape of a football! In addition to the colorful food items, stop by your local party supply shop to purchase football themed plastic table clothes, napkins, paper plates and cups. The party supply shop should also have some football shaped mylar balloons that you can use to decorate the area around the buffet table. 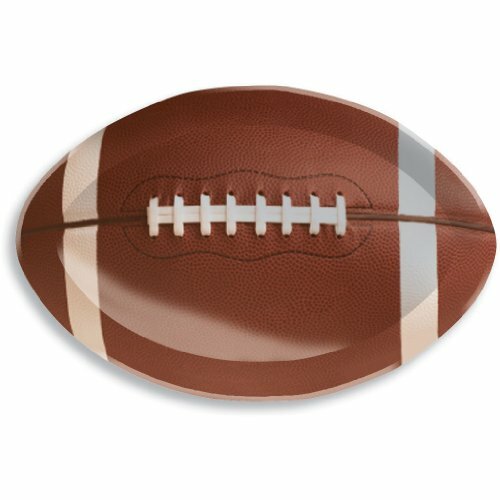 If you want to keep things really simple, you can just use this direct link to order a few Superbowl Party supplies from Amazon.com. Depending on the group, you may decide to serve beer, wine or cocktails at your Superbowl Party. However, you should keep an eye on anyone who is drinking heavily, especially if they plan to drive themselves home. In fact, if you think they've had too much to drink, see if you can arrange a ride for your guests. Try to serve plenty of non-alcoholic drinks as well, so people can alternate between alcoholic and non-alcoholic beverages. Having lots of food on hand will also lesson the chances that someone will over-indulge in alcohol. You want everyone to have a good time, and you don't your party ruined afterwards by a traffic accident or a DUI. Get everyone to wear sports jerseys or team colors for the teams they are supporting. If you don't want to pick sides, you could always wear a black and white referee striped shirt. Otherwise, join in the fun and wear your favorite football jersey, too. You might want to have some fun games to play, too. For example, you might want to ask people to guess which teams have won the most Superbowls or similar trivia. Other items you may wish to have handy are some foam footballs for tossing around, cheap toy pom poms and noisemakers for cheering, team pennants and similar novelty items. You might even buy some big plastic rings at the party supply store that you can give your guests as "Super Bowl Championship Rings" to commemorate the big game. This cute, inexpensive tray is perfect for your party. Order several so you can use them for chips, appetizers, cookies and more. What an easy way to decorate your table and serve your food! Everyone Will Be More Excited About the Game! 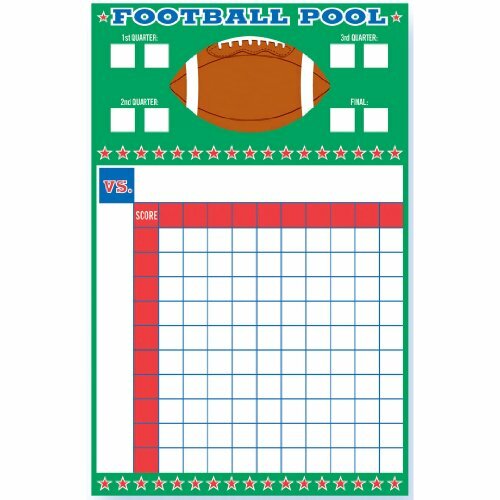 Everything you need to put together your football pool. I like the idea about wearing a ref shirt if you don't support either team. I love any excuse for a party! These ideas will all work well for all the New Years Day bowl game parties, too, as well as any time you want to hve friends over to watch a televised sporting event!